He is still on part time cloth diapering. Most of the time he is on cloth. At the moment, we are battling with diaper rash. *sighs* I find bepanthen to work like wonders than CJ BuTTer which is CD friendly. He is now able to wake up/ sit (with help) from laying down. He's always fascinates by colours (especially cartoons! I show him 15-30mins of TV time in the afternoon). Also, he likes to play with his hands and feet! Hehe too cute! He still refuses to have tummy time. What we usually do to encourage him is to put him on his tummy for 5mins at least daily or until he cries. Sometimes I put him on my tummy as well. He likes to talk a lot these days. Husband will talks to him during night time if Baby is not asleep. My parents like to rock him to sleep early night. So yea..
His sleeping pattern at night is not like other babies. Owl baby I must say, noticed this when I was pregnant. Need to work on his daily schedule asap! 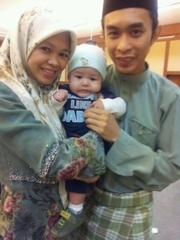 It has been a wonderful three months experience with Baby Iqbal around. We're excited to see what else he's ready to do and surprise us!